18 month old - Dot fed the cow bread! At around 17 month old, Dot starts to pretend play. She will coax her plush cow toy or other soft toys to sleep by patting on it, read stories, feed and offer drink to them. 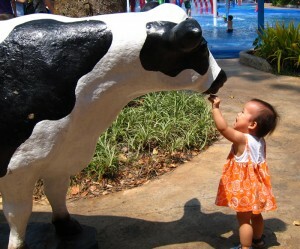 Recently she even gave her small piece of bread to the Ben & Jerry cow! Stop and listen for noises – birds chirping, airplane flying, dog barking..etc. Pretend that we are some animals roaring, barking etc. Dot builds her own obstacle course in the room using pillows, bolsters and jumping around. We pitch a tent in one of our room and pretend that we are camping. Pretend play is an imaginative activity that builds her social, emotional skills, language skills, thinking skills and nurturing her imagination. It is the foundation for all future higher learning and success. The importance of pretend play. Read more here.